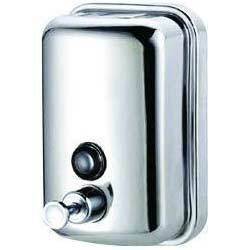 Our organization is actively engaged in manufacturing, trading & supplying of Soap Dispensers. These dispensers find extensive usage in various domestic and commercial places. Under the strict guidance of our experts, these dispensers are manufactured using quality assured raw material & cutting edge technology. Widely known for durability and require minimum maintenance. Our dispensers are available at nominal prices. Established in the year 1993, at Pune (Maharashtra, India), we, “DNA Enterprises”, are engaged in manufacturing, trading and supplying an array of Disposable Meal Trays, Paper Napkins, Fly Catcher Machines, Meal Tray Sealing Machines, Hand Dryers & Dispensers, Hotel Guest Amenities, Automatic Shoe Shining Machines, Cleaning Chemicals, Cleaning Equipment, Disposable Items, Air Curtains, etc. All this assortment of products is known for environment friendly, customized designs and sizes and cost-effectiveness. We manufactured them with superior grade raw material implementing latest technologies. Owing to their ability to impart a modern look & style, these are highly demanded in the market. In addition to this, our offered products can be availed in both standards as well as in customized versions as per the varied requirements of clients. Apart from this, clients can avail the offered products from us at cost-effective price range.